We can generate a set of ultra realistic images for any business area of our clients using our experience in 3D modelling and computer graphics. Professional services for professional advertisers, product managers, designers and architects. We have been working in the 3D visualization industry for more than 10 years. We employ strategic digital innovations that create photorealistic quality of our animation and renderings of stunning 3D assets. We consistently provide our clients with breathtaking visualization of their thoughts and ideas, making 3D art accurate and startlingly real. A view from any angle bringing photorealistic dimension to constructed or even idealized spaces. We effectively demonstrate the actual materials to be used, interior lighting, landscaping, natural lighting and moving objects, transferring ideas of our clients into imaginative conceptual animation. Our main goal is to deliver to our customers the highest level of satisfaction while maintaining affordability and promptness of our services.Throughout the development stages, we immerse you into emerging images. As a result, you get a product that is innovative, extraordinary, and spectacular. 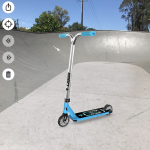 Elementals launched the Scooter Hut 3D Custom builder web and mobile app experience based on our AR Commerce platform. Our goal is to create visually stunning 3D applications and end-to-end eCommerce solutions for businesses based on our platform. We are very passionate Unity 3D developers! We are pioneers in non-game Virtual and Augmented reality solutions for businesses and enterprises. Also we are one of the first professional developers for Google Project Tango, Apple ARKit and Android ARCore. Elementals studio is a founding memeber of VR/AR association. © 2008-2019. Elementals Studio Pte. Ltd. All rights reserved.